This document explains how to access your DoIT Departmental Consolidated Billing Invoices using the DoIT Departmental Consolidated Billing Invoices module. The module also allows a user to request and view UDDSs not assigned to them via their payroll department. The request must be approved by DoIT Billing. Once approved the alternate UDDS bills will automatically appear in the users module. Open the DoIT Departmental Consolidated Billing Invoice app in MyUW. If you don't see the app on your homepage, search for "consolidated billing". From the search results page, you can add the app to your homepage for easier access in the future. The DoIT Consolidated Invoice Module will show all DoIT billing items associated with a users UDDS. It is mainly designed for billing users. However anyone who has a UDDS in their HR record will be able to see all the billing records associated with that UDDS. The billing records are not limited to those of the user. Within the DoIT Departmental Consolidated Billing Invoice module. Click the submit button to maximize your screen and review the list of reports (if any exist) that match the default criteria listed. The default UDDS Pattern Match is "All 7". The default month is the previous calendar month from today's date. In the example below there is 1 document for the previous month that matches all 7 digits for the UDDS appointment. 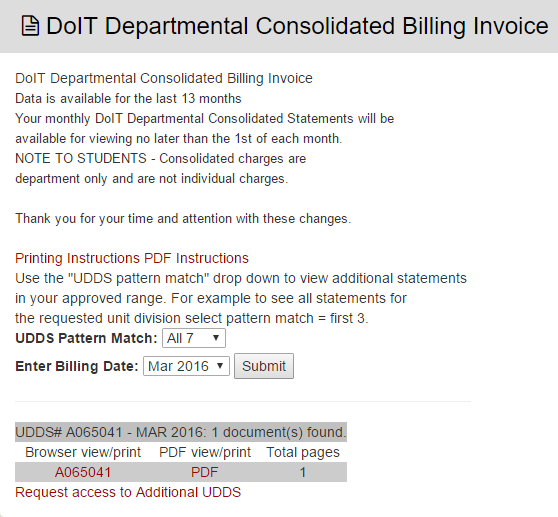 Click on one of the documents to view the actual DoIT Departmental Consolidated Billing Invoice. If the report has more than one page, you will see Next Page or Prev Page at the top of the report display; use these links to move from one page to another within one statement. At the top of each report page is the Zoom Percent box. The default percent is 125%. To alter the size of the report display for better viewing on your monitor, enter a different zoom percent amount and then click on theChange Zoom button. To submit a new request for DoIT Departmental Consolidated Billing reports, change the criteria. Select the UDDS Pattern Match: either "First 4" or "All 7". Your employing department will be matched to the customer number on the invoice by using just the first 4 digits or all 7 digits as you indicate. Select a Billing Date by picking one of the months in the list. Click Submit to retrieve your reports. When you are finished viewing a report, close the browser window. Each report you select to view will open in a new, separate browser window.